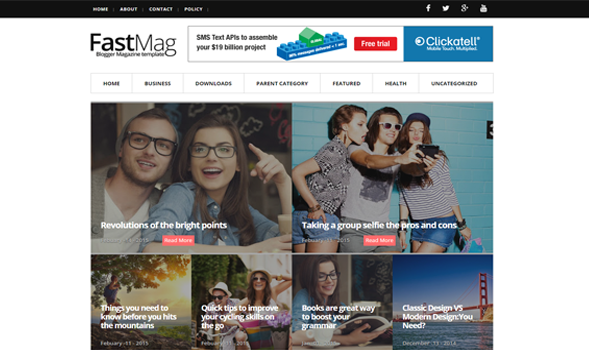 FastMag is a lightweight responsive blogger template for writers, journalists and photographers. It is miniminal in design and takes just few seconds to load. 100% Pure Responsive: Just like our previously released template Social Mag, this template is also responsive which indicated that your website looks great on smartphones and tablet as good as they look on desktop devices. Featured Post Area: We have added a efficient featured post area in this template that allows you to display specific posts on homepage. This gives you more authority over your blog design. SEO Optimized: It is becoming our standard, it is must to optimize the template for search engines. Therefore, this template is highly optimized to work great and help you to rank better in search engine.